Martin has been diagnosed with ADHD, but the medicine he has been given doesn't seem to help. The more he tries, the more he studies, it just doesn't matter, his grade just continue to drop. His father thinks he is just lazy and stupid, and believes he just needs to focus more on his school work and not Martins one thing he is good at, film making. Martin is awesome behind the camera, and one night while out filming some special shots, Martin gets some great film of, and makes a new friend in, Stick. Stick is into parkour, a free running kind of sport. Stick has his own issues in his life and parkour has helped keep him steady and centered since he was introduced. It was when Stick was helping Martin film some parkour for a contest that Stick's foster mom saw some of Martin's things and asked about his dyslexia. 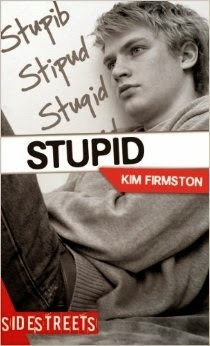 When Stick in passing asked Martin about his dyslexia, this is when Martin finally realizes all his life he has been misdiagnosed and there is a name for what he has and it isn't STUPID. With Stick and his sisters help his grades start to improve. Martin can finally prove to his dad through his movies how his brain sees the world and what the proper name is for what he has, dyslexia, not stupid. I want to thank Lorimar Sidestreet for this wonderful, if not expensive, opportunity for me. As I have now had to buy many more copies for distribution among different places. Our churches pre-school, yes, I know this is a teen book, but this is a awesome book for parents with children with dyslexia, and this pre-school tends to catch a lot of children with early literacy issues among 3-5 year olds. Also, there is a adult literacy group there as well and so I'm going to have put some copies in the church library for them, this might be the fist time some of them have been told they have dyslexia, so maybe they might want to know more about it and to know the name isn't stupid anymore. It might help them understand some of what they are going through. I know I wish this book had been around when I was a kid it really would have helped, if for no other reason than to know I wasn't the only one.